If Suki were a human, she would be a supermodel. She is such a stunningly beautiful cat. 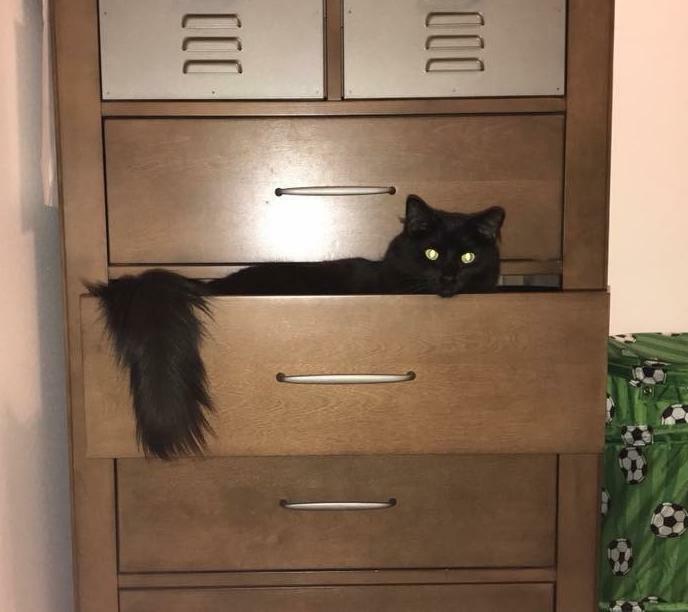 She is a black Persian mix cat for adoption, with amazing green eyes and the most fabulous, fluffy tail of any cat in Texas. Suki is healthy, fixed and up to date on shots. She is a very clean and well-behaved cat. As if her beauty were not enough, Suki possesses an equally lovely personality. 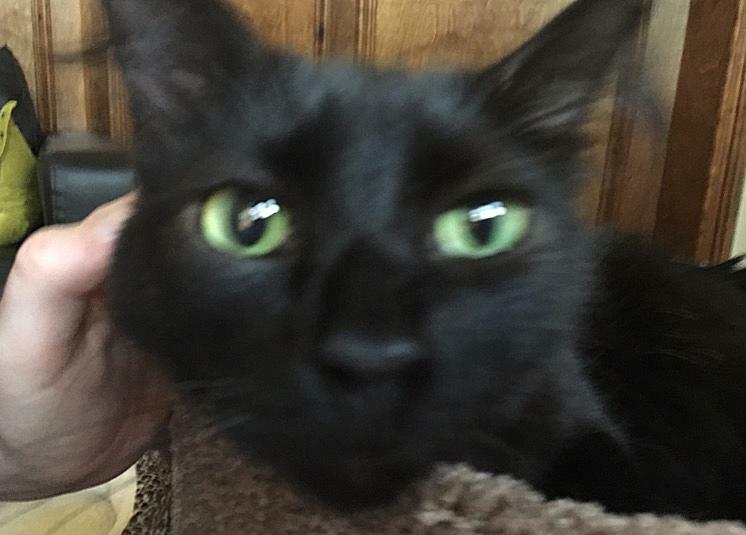 She is extremely affectionate with people and loves to snuggle and just be with you. Suki’s owners love her so much. And out of love, they are dearly hoping to find her the perfect new home. Suki is a true gem in the wrong setting due to her extreme fear of dogs. The owners have 2 dogs, and Suki is terrified of them. She is having to live sequestered in her own space, away from her owners. This situation makes Suki upset, and her owners want the best for her. 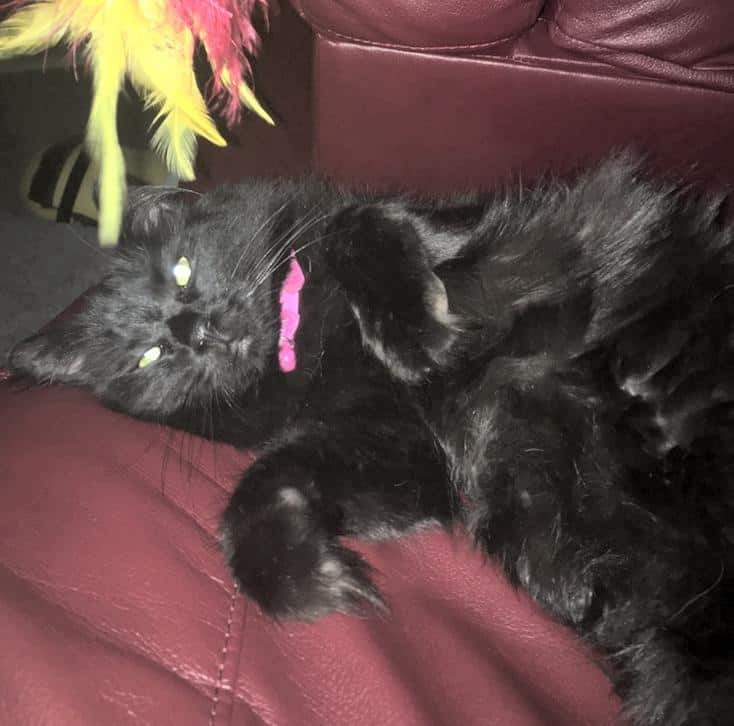 Suki’s ideal home would be with owners who have no other pets, and are looking for just one very special cat to spoil rotten. She is fine with older kids (10 and up) so long as they are respectful of her. Suki is an amazing cat. Please offer this gorgeoous black Persian mix cat the loving home she needs and deserves today. Suki will be rehomed with all supplies and vet records. All you need to add is plenty of cuddles and a safe, happy and healthy forever home. There is a $100 adoption/rehoming fee. Supplies and veterinary records will be included. 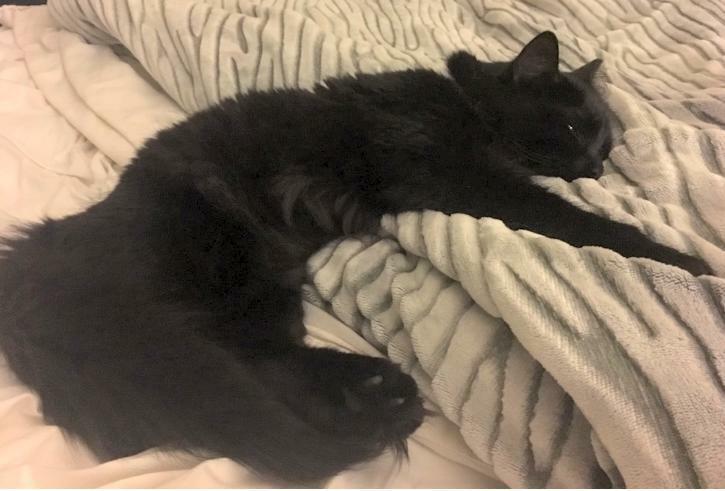 REQUEST TO MEET / ADOPT SUKI HERE! Questions about Suki? Contact our Houston cat rehoming team today. Text SUKI to (888) 833-2128 or email Suki@cat-lover.us. We look foward to hearing from you. Suki has a half pouch of Sheba morning & evening. She also has dried food in her dish to graze on as she wishes. She is eating Purina anti-fur ball at the moment. Suki has the most gentle & giving nature. She is an indoor cat and has never messed anywhere but her litter box. She loves nothing more than snuggling on our laps up in the movie room (dog free) and is calm and very happy. She doesn’t claw at the furniture and is very clean & a perfect house guest. The only problem we have is that she just won’t come down because of the dogs. This would be fun if she didn’t meow so often because she wants out company but is too frightened of the dogs. We just feel that Suki is not getting the company that she deserves. She is a perfect house cat and gives so much love to her humans. She’s just too timid to be around dogs. We have tried for almost 2 years hoping she would manage. When they are in kennels she roams around the house quite happily! Why is Suki Being Rehomed? We rescued Suki after seeing her in petco. We thought if we gave her time she would integrate into the family & get used to our two dogs. We have have given it almost 2 years and still she will not come downstairs if the dogs are there. 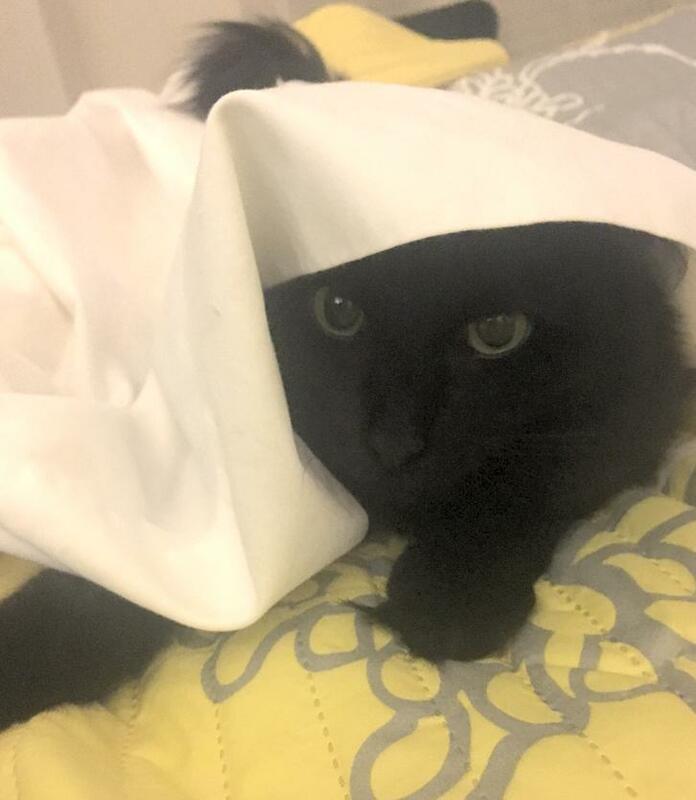 She is obviously lonely when she hears us downstairs and meows to get our attention. We have tried every which way to build her confidence but she just bolts the minute the dogs are around. It’s not working as her meowing gets quite loud when she’s feeling us she wants to come down but can’t! If you are interested in adopting this special For Adoption in Katy Texas, please fill out our online meeting request here. Once received and reviewed, our staff will ask the pets owner to reach out to you and arrange a meeting. 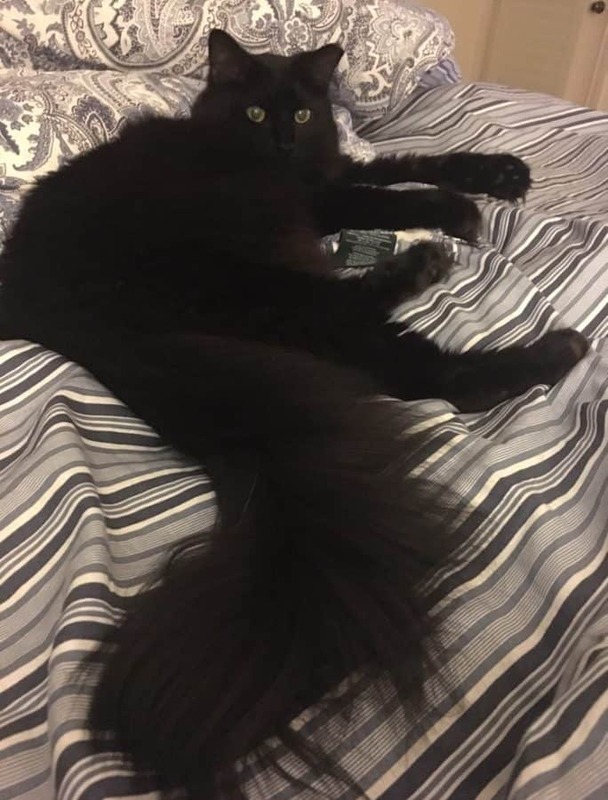 Adopt this stunning black longhaired Persian mix Cat in Katy Texas today. Questions about Suki? Contact our Persian cat rehoming team today. To request an opportunity to meet a pet showcased on our website, please fill out the form below. Once we receive your request, our rehoming coordinator will contact you. Please provide as much information as possible. This form is not intended to be intrusive, but ensures the safety and peace of mind of our families, who are inviting potential adopters into their homes. Thank you for your understanding. 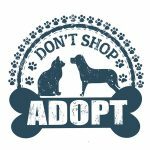 Should you and the pet's owner mutually agree to proceed with an adoption, there will be a rehoming fee required as listed on the pet's profile. 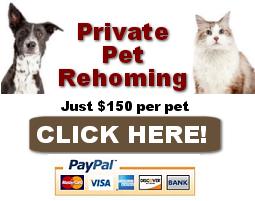 This fee will be due and payable to Find My Pet A Home before this pet is transferred to your care. If this pet has been adopted, or you are not selected to adopt, would you like to consider other suitable dogs or cats? Are you able to receive text messages on this number? This pet's current family may want to keep in touch and possibly visit on occasion. Are you OK with this? Our pet rehoming staff will contact you periodically for a year following adoption to ensure this pet's well-being. Are you OK with this? Please provide 2 references that we can call. These should be people who know you well and can verify that you are responsible, knowledgeable and able to provide a loving, forever home for this pet. The first reference should be a veterinarian or other pet care professional. Please provide the name and contact information for your current or previous veterinarian. 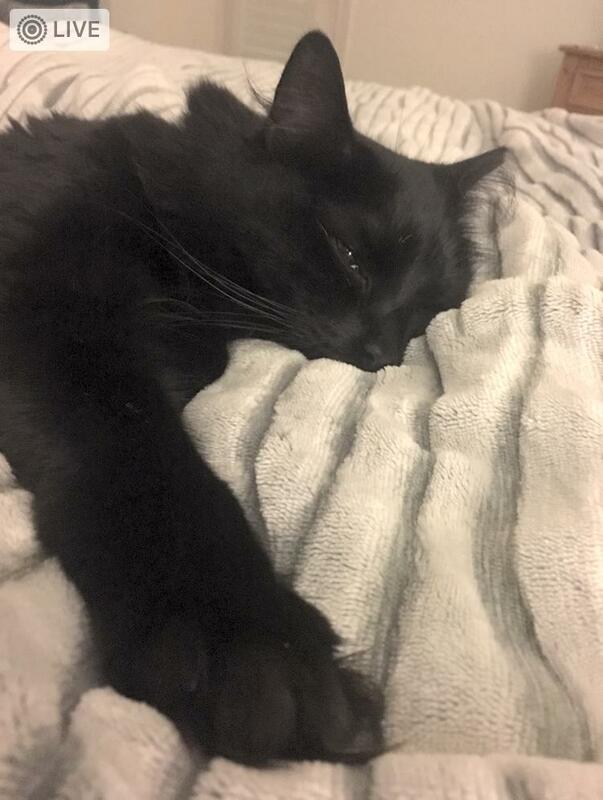 Please provide the name and contact information for someone who knows you well and can assure us of your ability to provide a good home for a pet. Please enter a value between 9 and 11. Finding good homes for preloved dogs, cats, puppies and kittens throughout Texas.